Professor Gretchen Tietjen recently received the annual John Graham lecture award from Paul Rizzoli and thanked friends and collaborators including Lynne Osborn Geweke, Dawn Buse, Sheena K. Aurora and Susan Lynn Hutchinson. Dr. Susan Hutchinson Featured In FREE Live Online Migraine Event, Register Now! The Migraine World Summit returns this April 23 – 29, 2017 to bring together over 30 top experts and doctors to provide answers, new treatments, research and best practices for migraine and chronic headache. It's available to anyone with an internet connection. Dr. Susan Hutchinson is one of the featured specialists. The Migraine World Summit returns this April 23 – 29, 2017 to bring together over 30 top experts and doctors to provide answers, new treatments, research and best practices for migraine and chronic headache. It's available to anyone with an internet connection. Dr. Susan Hutchinson is one of the featured specialists. Register for FREE now by clicking here. Last Saturday, August 6th, 2016, Dr. Susan Hutchinson appeared at the BlogHer16 conference at the JW Marriott Los Angeles as part of a panel sponsored by More To Migraine. Attendees took in a discussion about migraine, its impact, and resources to help manage it. 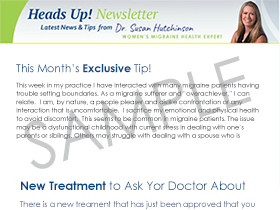 Get all the Latest Women's Migraine Health News, Exclusive Tips and More in Your Inbox!